When you need private dog training in Fannin and Gilmer County look no further than Cold Nose College! In-home schooling begins with a 1.5 hour initial consult to get to know you and your dog. We’ll discuss the various training options available and get you started right way. We’ll also collaborate with you to determine the number of follow-on sessions ($95/hr) needed to help you reach your goals for your dog. 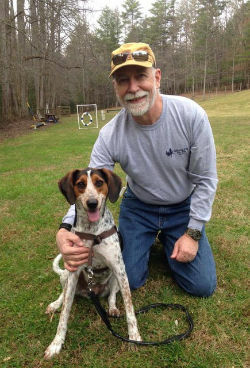 Need private Blue Ridge Dog Training? Ready for Results? We serve the communities of Mineral Bluff, Blue Ridge, Cherry Log, and Ellijay, Georgia. 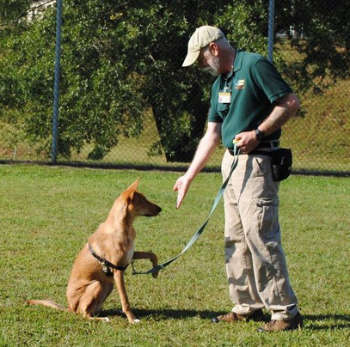 Jim’s favorite moment is when the guardian sees their dog learning a behavior. It's so rewarding to see the smile on their faces and the light in the dog’s eyes when they "get it!" That moment when they discover just how smart their dog is and how eager they are to learn with positive reinforcement is just magical. I highly recommend Cold Nose College! The classes are a wonderful asset and the private lessons at my home were invaluable. 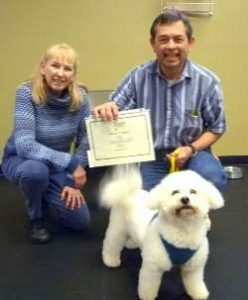 I recently took Jim’s Basic Manners class and even before we started the class, we had private lessons at our home with Jim. He helped wth our new puppy, Callie, and also with our older dog, Bailey. He is an exceptional trainer, easy to talk to and relate to and he always has an answer to any question about a dog. - Joyce S., Blue Ridge, Georgia. Before we started the class, we had private lessons at our home with Jim, (which I highly recommend whether with Jim or one of the other trainers.) He worked with Callie (puppy) but some days he worked with both Bailey and Callie, mostly working with Bailey to stay when visitors come to the door. He is an exceptional trainer, easy to talk to and relate to and he always has an answer to a problem with the dog. Just wanted to let you know how pleased I am with the results. Took Hunter to the Folk School today for a walk. Let him do his sniffing, etc. on the way out; "nice walk" back. He did so well. Still use a lot of our training. Targeting works so well if he gets wrapped around something, especially a briar. Of course "leave it" is a constant with him.